I’ve often expressed my admiration for the TED conference keynotes — 20-minute nuggets of insight, humor, provocation, and revelation by really smart and engaging people. A perfect fit for my bus ride home. So, I’m thrilled that the ground rules behind those great presentations are available on-line. 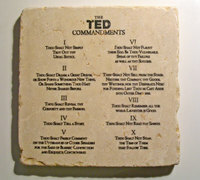 Tim Longhurst (via Garr Reynolds) offers a transcription of the ”TED Commandments’‘ that arrive on a stone tablet to those invited to speak (no, really, a stone tablet). Not to say that the rules make the speakers great, but they certainly help frame a positive space for greatness. And not just for public presentations and conference sessions: With minor modifications, this could be a manifesto for how cultural organizations should present, program, and communicate with their audiences. I saw there was a TEDxTokyo. does anybody know how to go about using TED style themes to organize a Leadership Renaissance seminar in Canada?